This grade point average calculator will help you to track your present GPA as well as set and meet goals for future grading periods (semesters or quarters). Specifically, this calculator creates individual GPA calculators for any number of grading periods you choose -- each of which recalculates as you enter the credit hours and select the letter grades for each class. 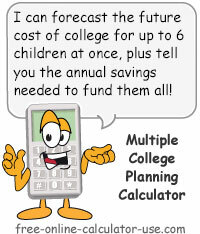 And unlike most grade point average calculators, this one even allows you to track your major GPA separately from your overall GPA. Plus, the calculator also includes features for tracking and calculating your cumulative GPA, as well as a built-in feature that tells you how many credits you need at 4.0 -- and how many you need at your own realistic grade point average -- to raise your GPA to a desired level. a feature for changing the quality point multipliers for each letter grade. a feature for converting between semester hours and quarter hours. a printer friendly report feature. How to calculate cumulative GPA. Calculate your GPA for any number of grading periods, with options to calculate your cumulative and target grade point averages. Expand the description in this row to make sure the default quality point multipliers match those used by your school. If the quality point multipliers are different from those used by your school, change the incorrect multipliers before moving on to the next line. Reseting the calculator will restore the default multipliers. Select the grading period used by your school. 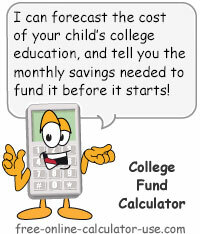 Your selection will only affect the labels displayed in the calculator. Enter the number of separate grading periods you would like to calculate a GPA for. The grade point average calculator will create a separate calculator for each grading period. Enter the greatest number of classes you will take in any one grading period. 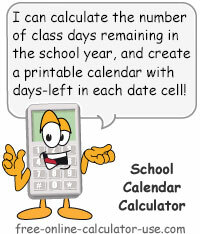 The grade point average calculator will include this number of classes in each grading period calculator it creates. If you have an existing cumulative GPA and would like the calculator to readjust it as you calculate your GPA for one or more grading periods, tap the plus (+) icon to expand the section and enter your cumulative quality points and GPA in the applicable fields. Note that these fields are required in order for the calculator to calculate the credit hours and grades needed to raise your GPA (next section). If your school lists earned and quality hours separately, enter the earned hours on this row. Note that earned hours are not necessary for calculating cumulative GPA. If you want to have the calculator recalculate your cumulative GPA, enter your cumulative quality hours on this line. Only enter Major quality hours if you know your cumulative major GPA. If you entered cumulative quality hours on the previous line, enter the cumulative GPA on this line. If you want the calculator to calculate how many credit hours and at what grade you will need to raise your GPA, tap the plus (+) icon to expand the section and enter your target and future GPA estimates in this section. Note that in order for this to work you will need to have entered your cumulative quality points and GPA in the section above this one. If you would like the calculator to estimate how many credit hours and at what letter grade you will need to raise your GPA, enter a target GPA that is greater than your cumulative GPA. Only enter a Major target GPA if you know what your cumulative major GPA is. Enter a future GPA that is greater than your cumulative GPA, and that you believe you can actually achieve. In other words, if your cumulative GPA is 2.5, and you wish to raise your GPA to 3.0, but you feel the best GPA you could earn for your future grading periods is 3.75, enter 3.75 as your future GPA. If you have a mixture of credit hour types due to transferred credit hours, use this tool to convert the transferred hours to the type currently being used. To convert between semester hours and quarter hours, enter the known credit hours in the appropriate field and the known credit hours will be converted to the unknown credit hours. Note that the converted hours are rounded up to the nearest whole number. Enter the number of semester hours you would like converted to quarter hours. Enter the number of quarter hours you would like converted to semester hours. Tap the Quality point settings button to see if the default settings match those used by your school. If not, make the necessary changes. Select either Semesters or Quarters. Enter the number of grade periods you would like to calculate GPA for. Enter the maximum number of classes you would take in a single grading period. If you would like to get an update on your cumulative GPA, expand and complete the Cumulative section. If you would like the calculator to calculate the GPA you need to average to achieve your goal GPA, expand and complete the Raise GPA section. If you need to convert between semester hours and quarter hours, expand and use the Conversion Tool section. 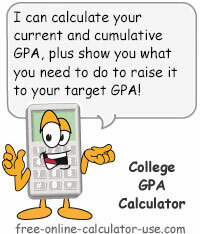 Tap the Create GPA Calculator button. This will create and display a separate calculator for each of the number of grading periods you are calculating your GPA for. Once you have entered the titles and stats for all classes and grading periods, tap the Printer Friendly Report button to open the results in a new window for printing. What GPA is and how to calculate it manually. GPA is an acronym for Grade Point Average, which is used to track your level of success for each grading period (semester or quarter), as well as for tracking your cumulative measure of success over the course of your college education. Since your GPA is one of the first things potential employers look for in your college transcript, it's extremely important that you work hard to maintain a high GPA. This is especially true in the early days of your college education, because the more credit hours you accumulate at lower grades, the longer it will take to raise your GPA. In order to calculate your grade point average for one grading period, you first need to understand the key variables that make up the formula. Credit hours: Each class you take will have a number of credit hours assigned to it, which are usually listed in your school's course catalog. Credit hours per class typically range between 1 and 5. Quality credit hours: Credit hours earned for classes that are taken for a letter grade versus classes taken on a Pass/No-Pass basis. Quality point multipliers: The number of points awarded for an earned letter grade (A = 4 points, B = 3 points, etc.). The quality point multipliers can vary slightly from school to school, which is why the calculator on this page allows you to edit the default multipliers to match those of your school. Quality points: The product of the earned quality credit hours multiplied by the letter grade's corresponding quality point multiplier. For example, if you earn an A in a 4-credit-hour class, the quality points earned would be 16 (4 credit hours x multiplier of 4 for an A = 16). Your cumulative grade point average is calculated basically the same way you calculate GPA for a single grading period, except you will be using your total quality points to-date and total quality credit hours earned to-date. To calculate what you need to do to raise your grade point average from your present average to a desired average, you can use one of two methods: the Straight A Method, or the Realistic Grade Method. I'll present the formulas for each separately. So using this method you would need to get straight "A"s in your next 30 quality credit hours in order to raise your grade point average from 2.5 to 3.0. So in order to raise your grade point average from 2.5 to 3.0 using a realistic future GPA of 3.5, you would need to average 3.5 in your next 60 quality credit hours. If a portion of your earned credit hours are from a school that used different grading periods than your present school, then in order to calculate your cumulative grade point average you will need to convert the unlike credit hours to match the grading period of your present school. Even though the calculator on this page has a built-in credit hour conversion tool, I will list the formulas used by the calculator in case you want to convert the hours manually.